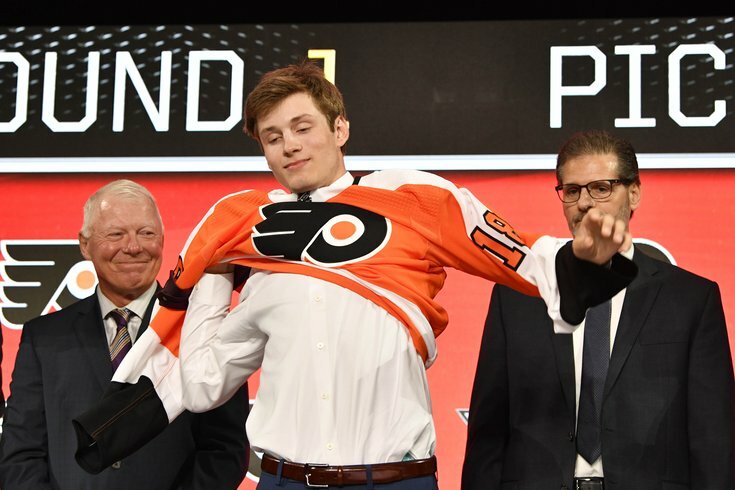 Joel Farabee puts on a Flyers jersey after being selected with the 14th overall pick. With the 14th overall pick in the 2018 NHL Draft, the Philadelphia selected forward Joel Farabee, an 18-year-old winger from New York who will play for Boston University next season. "It's awesome. I really dont even have any words right now — I am soaking it in," Farabee said on the NBCSN broadcast immediately after he was taken by the Flyers. "I am honored to be a part of this organization. But first, Farabee has some work to do. Luckily, he's headed to the right place. "I need to definitely put on some weight and work on playing a bigger role along with the weight," he continued. "I will definitely do that at college." Here's what we know about the newest member of the Flyers organization. Farabee, 6-foot, 162 pounds, heading to BU in the fall. Flyers could sure use a scoring winger. First time they’ve taken one in the first round since James van Riemsdyk. Farabee's dad is from Philly area, so he's already a Philly fan. Farabee said he wanted to go to the Flyers because his dad grew up in the Philly area. So what do we get in Farabee now? We have a player who is one of the best skaters in the draft and uses that to create offense. He uses his speed to burn past defenders and then he uses his pro shot in a variety of ways. He is surprisingly effective around the net for someone of his stature. His fearlessness and work ethic make him a load to handle in the offensive zone. What sets Farabee apart is how effective he is defensively. He uses his smarts to put himself in position to intercept passes and break up plays. Once he gets the puck on his stick, he’s excellent at transition offense. He’s one of the best 200-foot players at the top of the draft.